For the uninitiated, #DigitalPorts, or Digital Portsmouth, is a quarterly event that is part of the Innovation & Leadership series at The Music Hall Loft, co-curated by The Music Hall’s Monte Bohanan and Alpha Loft‘s Joshua Cyr. Its topics cover various digital disciplines, including tips and advice for marketing, startup, business professionals and overall geeks, as well as a lively networking hour. January 2016’s theme was “The Art of Copywriting.” I was one of three speakers at this event (you can find a recap of my portion of the event here), and we all shared on topics related to copywriting. 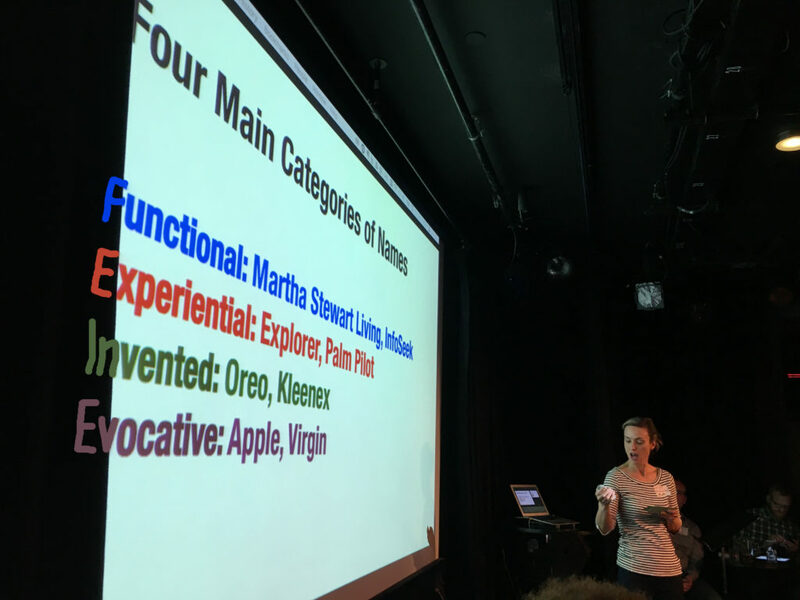 My biggest takeaway from Anna was how she broke down these four main categories of names: Functional, Experiential, Invented and Evocative. I’ve done a lot of name brainstorming, and often have used various “buckets” or categories to help that process, especially once types emerge. But this four-category taxonomy was superior to the one I’d been using previously. I was excited to add this tip to my brainstorming process. These four categories are also used by a naming company named Igor. On their website, they have a really helpful chart of competitor research using this taxonomy. Their example uses competitive analysis of juice brands. They even have a blank name taxonomy that you can print and fill out for your industry. Pretty handy. A great name might be straightforward or clever — but a working knowledge of puns always helps, even if you’re not going for the overly-clever name. Puns are all about word associations. These are fun projects for anyone involved, and since I’m a HUGE fan of puns, a name brainstorming exercise with puns is right up my alley. 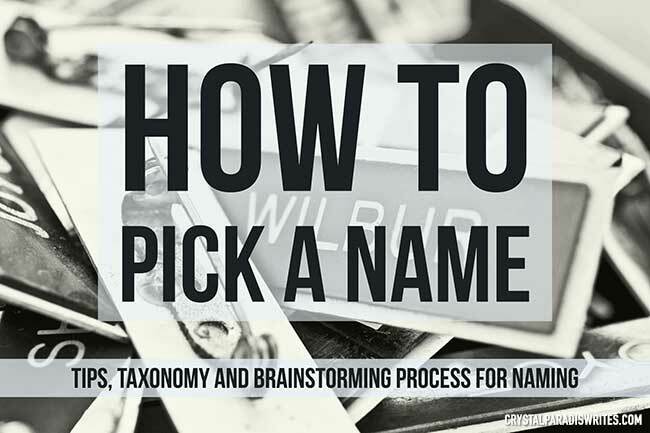 My personal name brainstorming process has evolved over time, and I’ve found it really helpful to go this exercise before a bigger name brainstorming meeting. I’ve noted in dark red text where this new #DigitalPorts expertise from Anna has really upped my name brainstorming game. Google relevant terms/phrases and relevant industry blogs to see what current trends are/what they’re talking about. Competitor analysis — where do they fit into these four categories? This process really sets me up for success when I walk into a name brainstorming meeting. Coming with a bunch of viable options to throw around and discuss is key. The group name brainstorm is usually where the real magic happens. It’s key to get a few people from very different specialties or backgrounds to attend. Get the creative thinkers, the punsters and the ones who love embracing new challenges. At my previous agency, we often had up to 10 people in the room at once, and everyone left their internal filters at the door. If you’re the one facilitating the event, willingness to be the one to voice “bad” ideas, or ideas that you know will sound silly, is a really important role.This is something that I learned from my former boss: make the decision to be “that person” up front and you’ll make the whole room feel better about letting their filter go. Be sure to remind everyone that sometimes it’s the bad ideas that spark the great ones. Have name brainstorming tips to share? Leave them in the comments. And thank you to Anna at The Hired Pens for your expertise, and to Igor for the handy taxonomy matrix.